About Us – Architecture Tours L.A. Earning a Master’s degree in architectural history, Laura first got interested in the subject as an undergraduate student studying design at the Fashion Institute of Technology in New York City. She found her course work in historic preservation and architectural history to be the most fascinating and compelling of all. When Laura decided to make her home in Lo s Angeles, she was fascinated by what she saw in the rich diversity of architectural styles, cultural representation and artistic experimentation. Towards the completion of her graduate degree she started by writing papers on the Los Angeles work of Frank Lloyd Wright and ended with a thesis topic of Postmodern Architecture in Los Angeles, which spanned the complete history of architecture in Los Angeles. 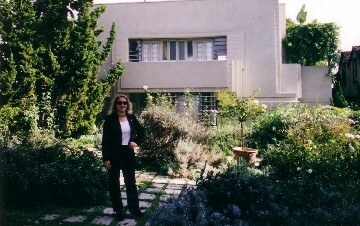 After choosing a career in art, working with art appraisers, in art bookstores, auction houses and art galleries including The Gallery for Architecture, she decided to return to the roots of her education and now shares her specialized knowledge and passion for the history of architecture in Los Angeles with those who wish to explore with her. Laura is a member of The Los Angeles Conservancy and the Historical Society of Southern California as well as The National Trust for Historic Preservation, the Museum of Contemporary Art and the Society of Architectural Historians. She is also the author of a series of guidebooks based on the tours which can be purchased online at http://www.amazon.com and http://www.schifferbooks.com.